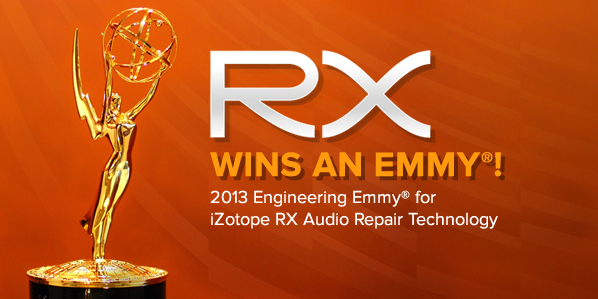 We want to congratulate our friends at iZtotope for winning an engineering Emmy for RX. Just in time for RX 3’s arrival, the Board of Governors of the Academy of Television Arts & Sciences has awarded iZotope a 2013 Engineering Emmy® for RX Audio Repair Technology! This award is presented to an individual, company or organization for engineering developments so significant that they materially affect the transmission, recording or reception of television. “We are so proud to add this Engineering Emmy to RX’s sterling resume, and even more proud to introduce the next version of our flagship audio repair tools to such a supportive user community. READ MORE about RX’s Emmy award. TRY the new RX 3.